The PSA China invites all photographers to enter the 14th PSA China international exhibition of photography to be held in China. PSA China was founded in 2009. It has ever since devoted fully to the promotion of the art and technology of photography and extended services to all photographers in China, especially the PSA members. The mission of PSA China is to bring together people interested in photography, to promote the highest standards and to embrace the future while continually supporting the present. 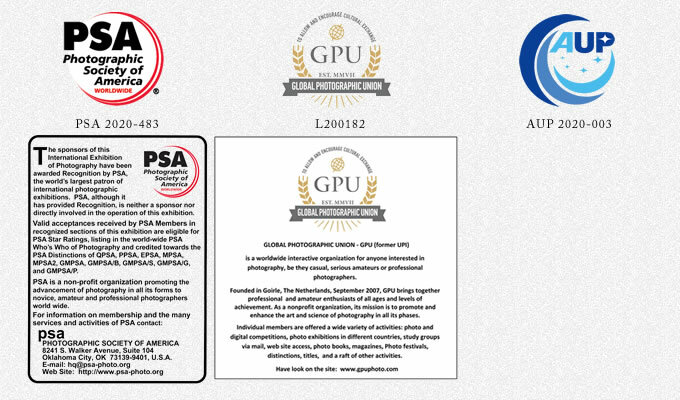 PSA China is proud to have the Patronage of the Photographic Society of America (PSA), Global Photographic Union (GPU) and Alliance of Universal Photographers (AUP). The exhibition is recognized by Photographic Society of America (PSA), the world’s largest patron of international photographic exhibitions. Acceptances received by PSA members in each section of this exhibition are eligible for PSA Star Ratings, PSA Who’s Who in photography and credited toward the PSA Distinctions. The Exhibition will be organized in accordance with the standard and requirements of PSA. Ms. Li Wang Chairperson of PSAChina International Exhibition of Photography, IR (International Representative) of Photographic Society of America (PSA), Director of PSA China. Mr. Daduan Deng Chairman of PSA China. PSA Lead International Representative in China. Senior member of Photographic Society of New York. Honorary Consultant and Life Honorary Chairman of Guangdong Youth Photographers Association. Mr. John Davis APSA, PPSA, Former President of PSA. Mr. Henry C.Ng APSA, EPSA, Former Image Collections Vice President of PSA, PSA Ambassador - Asia. Awarded the Top Ten Photographers of International Exhibition of Photography. Ranked No.1 in both Color Slide and Photo Travel sections of International Exhibition of Photography. Mr. Thomas Lang Former President of Asia Pacific Chapter, International Exhibition Committee of PSA. Awarded the Top Ten Photographers in Color Slides section. Awarded the Top Ten Photographers in Photo Travel section of the North America Exhibition in six years. Awarded the Top Ten Photographers of International Exhibition of Photography. Mr. Gunther Riehle APSA, GMPSA/b, the founder of the German Mega Circuit, the German Open Circuit, the German Southern Circuit, and My Favourite Circuit. Mr. Brian Magor MPSA, EFIAp/b, CPAGB. Exhibition Standards Director for the Photo Travel Division of the PSA. Has judged Wrekin Salon, Solway Salon, Wilmington Exhibition, and the German PhotoCup, Has been the Chairman of the Hoylake International Exhibition since 2012. Mr. Tony Potter APSA, GMPSA, EFIAP/Plat., ARPS, APAGB, DPAGB, Founder member and chair of West Cumbria Photo Group, International judge and lecturer, Panel member for the Royal Photographic Society distinction awards. PSA UK member representative. Fees should be paid via PayPal account: wangli@seec.com.cn. Cash or checks are not acceptable. Entries without the appropriate fees will not be judged. Should you have any questions, please directly contact us via e-mail: service@psachina.org.